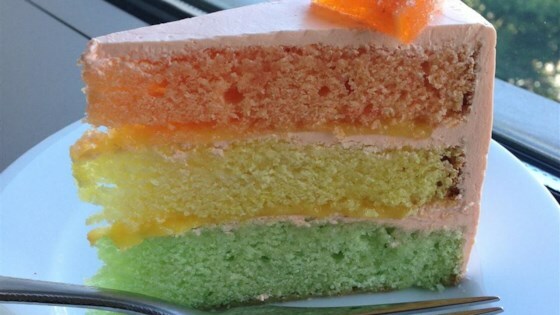 "Tri-colored cake with a lemon layer, lime layer and an orange layer. The filling is a lemon curd and the frosting is orange." Get the recipe for Lemon Custard Filling. Get the recipe for Orange Cream Frosting. Not bad but not the best cake I've had. I love citrus so this recipe intrigued me. Cake was dry and frosting a little too sweet for my tastes. Leftover cake went uneaten.